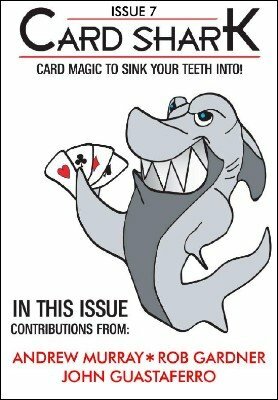 Welcome to ISSUE 7 of CARDSHARK, the highly anticipated monthly card magazine that contains awesome tricks from magicians around the world. This issue contains five great tricks, which will feed your card magic needs! I am very excited to say that we have an excellent new trick and a classic from John Guastaferro, a new trick from Andrew Murray plus two fantastic new tricks from Rob Gardner, all for only $2.80! Plus, thanks to a great John Guastaferro idea, the first three tricks form an awesome routine! V.I.P. Production by Andrew Murray – A great Ace production from Andrew Murray's Ebook Wisdom Begins With Wonder. Really visual, plus pretty easy to do! Daley Prequel by John Guastaferro – A great prequel to Dr. Daley's Last Trick. Very simple. But extremely hard – hitting. Assembly Line by John Guastaferro – This is one of my favourite John Guastaferro routines, and is from his Ready, Get Set, GuastaferrO! ebook – it is an Ace Assembly type effect, that happens in the spectator's hands! Also included is a killer addition for this routine. Slop Poker by Rob Gardner – A simply amazing trick that centres around gambling and triumph. It has an incredible ending! Telstart Collectors – Rob strikes again with a brilliant take on collectors that is easy to do, hard hitting and really strong! It involves ace cutting with a collectors finish. Card workers will love this. 1st edition 2012; 12 pages.